It might seem odd that a lover of children's literature and a plant biologist would embark on a professional relationship. But for biology professor Mark Lubkowitz and education professor Valerie Bang-Jensen, both teachers at Saint Michael's College, that was the only logical option. "So we made a garden. What else would you do?" Lubkowitz jokes. He's referring to the Teaching Gardens at Saint Mike's — a collection of gardens that spans the quad adjacent to the McCarthy Arts Center. The 10-year-old natural outdoor laboratory represents the collaboration of the two professors and the education, biology and applied linguistics departments. The gardens are designed to promote literature and literacy, Bang-Jensen's specialty, and both professors have their students plan and cultivate the gardens each year as part of their coursework. As future teachers, Bang-Jensen's education students need to be versed in every discipline, so she asked Lubkowitz to bring his perspective to one of her classes. The two realized that their students see things differently as a result of their training. The professors decided to create an interdisciplinary freshman seminar called "Digging Down to the Roots: The Meaning of Gardens." Their aim is to have undergrads solve what they call "an authentic problem" each semester. The problem? To make and maintain the gardens within the themes set by the two professors. For instance, the students will select books to represent in the gardens using plants that correspond to the story. The gardens feature classics such as The Wonderful Wizard of Oz (poppy) as well as recent novels like The Hunger Games (primrose). On the first day of class, the professors have their students to get their hands dirty in the gardens. They enlist their other classes to further collaborate. Lubkowitz's students bring botany and plant biology experience. "My class will have to work with Valerie's class to do something they couldn't have done on their own," he explains. "Higher education is really good at focusing the way we see the world and creating expertise, which is very appropriate," Lubkowitz says. "At the same time, if you want to solve a complex problem, you have be able to communicate to other experts and see their perspective and integrate it into something that captures many different perspectives." 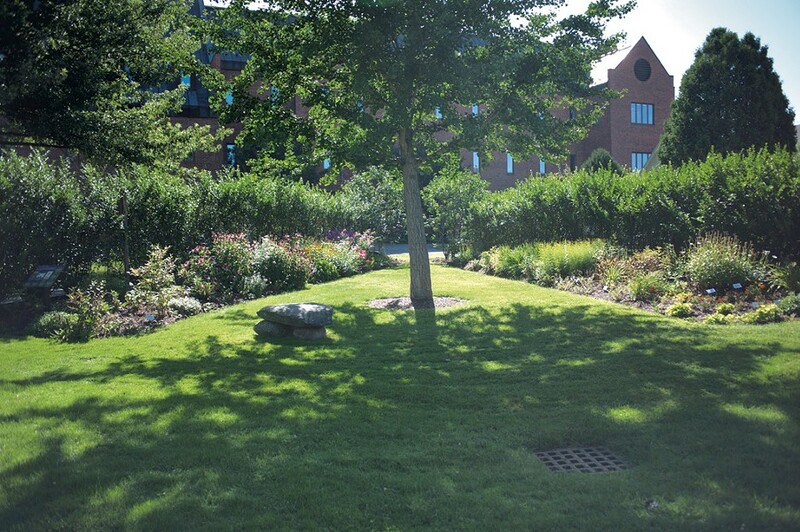 There are four Teaching Gardens: Books in Bloom, Native Plants of Vermont Garden, International Garden and the Word Garden. The Books in Bloom section looks "metaphorically like a book," says Bang-Jensen, and features flowers from notable children's literature. Native Plants is just that: florae that are native to or thrive in Vermont. The International Garden contains plants arranged like the continents, with a pathway parallel to the equator. The Word Garden features words printed on small stones. 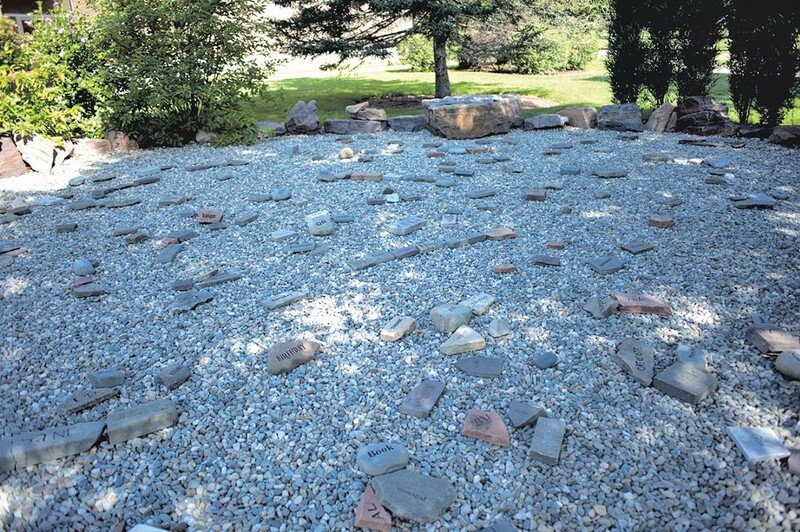 Vermont artist Chris Cleary made signs marking each of the gardens with text blasted in stone. When Bang-Jensen visited his studio in Jericho, she says, she fell in love with Cleary's "word salad" in his yard, an arrangement that showcases all the fonts he uses. "And we said that we need this on a college campus," she recalls. "This is life-size magnetic poetry and more artistically done." The Word Garden also holds a chessboard etched into a stone, on which visitors can use little rocks as checkers pieces, or their own chess sets (students with SMC IDs can check one out). Visitors can also write comments with chalk on a piece of slate. This outdoor classroom is not just for college students. The gardens are open to all visitors, from theater patrons waiting for a show to kids from one of the many elementary classrooms Bang-Jensen and Lubkowitz have visited. When college classes are in session, students give tours of the space, but in the summer they can be self-guided. Bang-Jensen admits that when she and Lubkowitz started the gardens, they had no idea whether the concept would take root. She soon discovered that "this is the kind of community that can handle this." Even so, she adds, "Every now and then something disappears." She's referring to a specific disappearance a few years ago: a stone bearing the word "Weed" went missing. "I went to email Mark and say, 'Weed is gone,' and my husband said, 'What do you expect? It's 4/20!'" Bang-Jensen recalls. "So we sent out an email to everyone on campus." The subject heading was "We're Looking for Weed." The professors got their stone back that year, though "Weed" has since disappeared again, apparently for good. Minor theft aside, Bang-Jensen and Lubkowitz are pleased with the garden's first successful decade and are looking forward to the completion of a new addition this month. "It's a giant stone arch! It will be seven feet in the center," Lubkowitz says. "Imagine if a giant had built an arch and then pushed out the center piece. The plinth will be further out, so when you stand there you can see through." 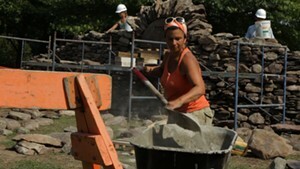 Morrisville sculptor and stonemason Thea Alvin is creating the stone arch in an empty plot next to the gardens. The permanent installation will require 28 pallets of stone and weigh 40 tons. With the help of students, Alvin aims to complete the sculpture in mid-September. In a phone conversation, Alvin explains that she's using Pennsylvania fieldstone — a blue stone with a purple cast. "We wanted a contrast with the green of the gardens and the red of the brick," she says. Alvin is known for her arches and other massive installations created from numerous pieces of stone; the New York Times featured her in an article last year. The Teaching Gardens are not the only thing Bang-Jensen and Lubkowitz have cultivated together. They coauthored a book titled Books in Bloom, published this year by the National Gardening Association. Heavily inspired by their garden of the same name, it is intended to teach children about science and provides lesson plans for elementary school teachers through an interdisciplinary lens. At Saint Michael's, Bang-Jensen and Lubkowitz hope that their gardens will continue to grow, but joke that future caretakers "probably haven't been hired yet." For now, they intend to keep spreading literacy through gardening and bridging the gap between the critical thinking methods of their two disciplines. "The school gardening movement is burgeoning," Bang-Jensen says. "One of the main areas of focus is food and health, and that's wonderful; at the same time, they could be doing much more with literacy, and so that's sort of been our aim." The original print version of this article was headlined "Growing Ideas"